Colorful flowers and foliage that dazzle the eyes, fragrant to pungent odors that tickle the nose, textures and temperatures that warm the hands and the heart—these are the joys of the growing seasons. So where, beyond snow-covered landscapes, does one search in winter for wonders of the natural world? 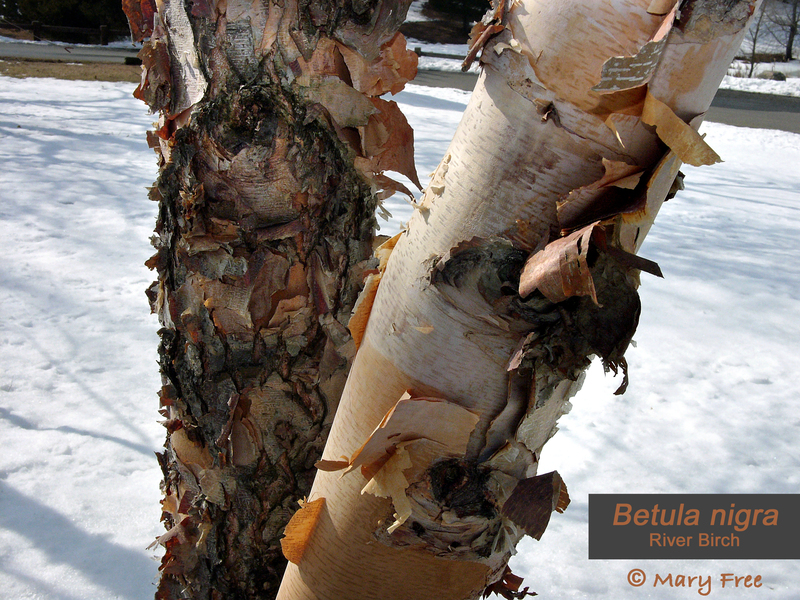 If one looks carefully at that which winter has laid bare, then the beauty of bark emerges. With no leaves to obscure the view, one can truly appreciate the varying colors, textures, and patterns of deciduous tree barks. Bark functions as the first line of defense for every tree, but its physical aspects show considerable variability among species. Why is this? The appearance and composition of bark is the product of each species’ response to the internal pressures from growth, and to the external pressures from the environment. Outer bark—primarily dead cells—includes the external epidermis (found in early growth) and an underlying periderm (composed of three layers of tissue). It protects the tree against the weather elements (rain, snow, hot and cold temperatures) and foreign bodies (pests, fungi, and bacteria). The inner bark is made of living tissue called phloem, which carries sap (water mixed with the sugars made through photosynthesis by the leaves) throughout the tree. Next to the phloem is growing tissue called vascular cambium, which makes new phloem cells, and new xylem (wood), the layer on the inner side of the vascular cambium. Active xylem (sapwood) carries water and nutrients from the roots up to the leaves; inactive xylem becomes the heartwood of a tree. This diagram shows the basic tissue layers of a cross-section of a common tree trunk. Original image created by Brer Lappin, public domain. Bark is an important identifying feature of trees. 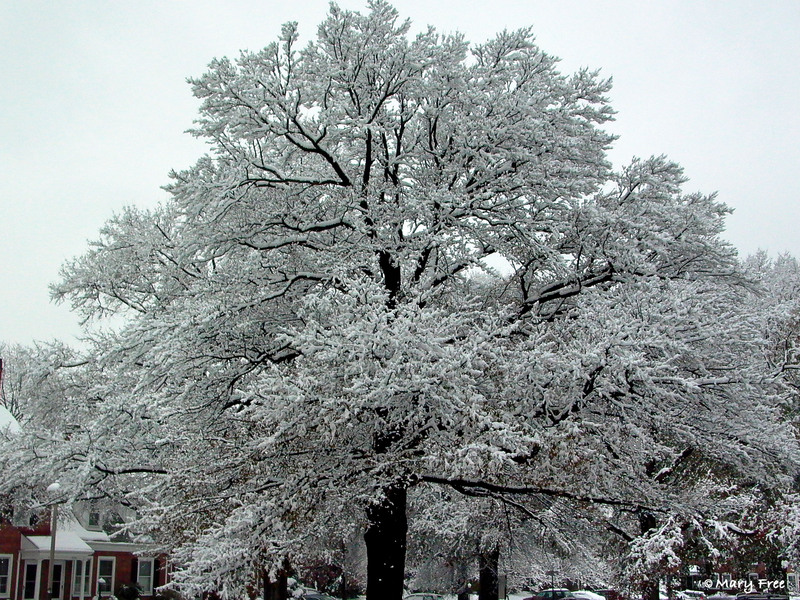 Among our native trees, one looks for the mottling of Platanus occidentalis (American sycamore), the diamond-patterning of ash, the square-plating of dogwood, the shaggy strips of Ostrya virginiana (Eastern hop-hornbeam), the shredding of Juniperus virginiana (Eastern redcedar), the corky, wing-like projections of Liquidambar styraciflua (sweetgum), and the plating of Quercus alba (white oak). Some descriptions evoke vivid images of the “burnt potato chip” bark of Prunus serotina (black cherry) (Hayek 2015, 25) and the smooth, sinewy bark of Carpus caroliniana (musclewood or American hornbeam). Then there is the image evoked by one word—birch—a lean trunk with white, paper-like bark and horizontal lines. Not all birches are white or have bark that peels off in papery strips. However, birches do have distinctive horizontal markings called lenticels, which are pores that allow the direct exchange of gases between the inner tissues and the atmosphere. It takes decades for some trunks to lose this identifying characteristic as a more furrowed or platy periderm emerges and obscures the lenticels. The mid-Atlantic region is home to a number of native birch species, although not all are at home everywhere in the mid-Atlantic. Five of those birch tree species can be seen in “The Beauty of Birch” video (below) filmed at the Connecticut College Arboretum in New London, Connecticut. Learn more about each of these species in Are You Lichen the Bark? Part 2. Five Birch Trees of the Mid-Atlantic Region. When looking closely at bark, one may notice the presence of organisms like lichens and mosses. Some gardeners worry that they might pose a threat to the tree or are indicative of disease, but neither is parasitic. A lichen is a complex life form that is a symbiotic union of two separate life forms, a fungus and an alga. Moss, on the other hand, is a non-vascular plant. Both lichens and mosses produce their own food and for the most part, the filaments that anchor them to their substrates are non-penetrating. Lichens and mosses appear on healthy trees, as well as those in decline, and generally will not harm the trees to which they attach themselves. There are about 17,000 species of lichens worldwide (including 3,600 known species of lichens in North America) and about 15,000 species of mosses from the Arctic to Antarctica (Monthey and Dudzik 2010, 2). Their intricate forms and subtle to bold color palettes are beautiful to behold, and as winter provides the best opportunity to view bark, it also provides the best time to search for and observe lichens and mosses. Learn more about these fascinating organisms in Are You Lichen the Bark? Part 3. Lichens and Mosses. Hirons, Andrew and Peter A. Thomas. 2018. “Applied Tree Biology.” Hoboken, NJ: John Wiley & Sons Ltd., 43. Part 3: Lichens and Mosses (February 13, 2019). This entry was posted in MG in the Garden, Public Education, Video and tagged American hornbeam, American sycamore, bark, Betula nigra, black cherry, cambium, Carpus caroliniana, Eastern redcedar, Juniperus virginiana, Liquidambar styraciflua, musclewood, phloem, Platanus occidentalis, Prunus serotina, quercus alba, Red Birch, River birch, sweetgum, white oak, xylem. Bookmark the permalink.